In spring 2012 a rogue seedling in a newly purchased pot of hakonechloa caught my attention, its leaves were a vivid emerald green and it promised a pleasing tufty habit. It flowered later that year, unmistakably as deshamspia cespitosa, or according to the RHS who also provide descriptive common names, either tufted hair, or hassock, or tussock grass. Locally, in the Forest of Dean, I have heard it called ‘forest fairy grass’. Deschampsia is one of the most widespread of grasses, native species are mainly found in northerly latitudes with cooler climates where it colonises a range of habitats. 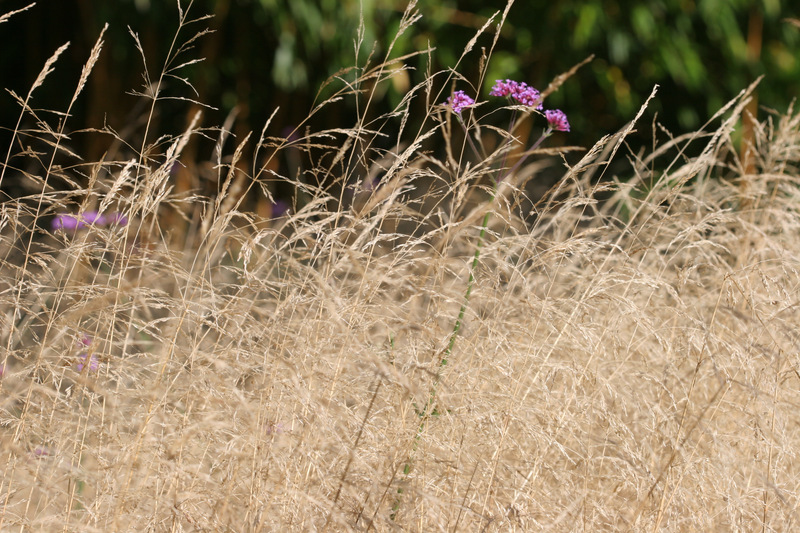 Given its adaptable nature and good looks, it’s a popular grass for informal planting schemes. 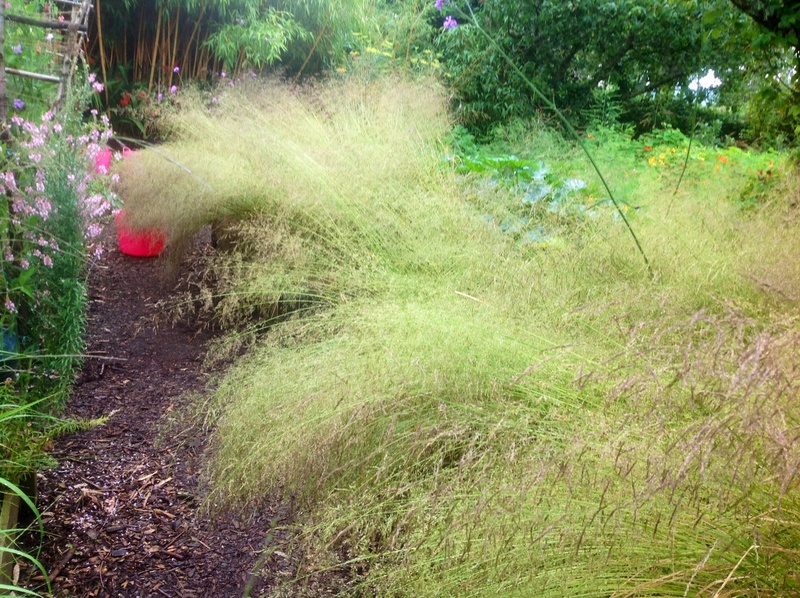 There are quite a few to choose from too, from the more compact Deschampsia cespitosa ‘Bronzeschleier’ (‘Bronze Veil’) to the taller ‘Goltau’ (‘Gold Dew’). Whatever its origins, my chance seedling once in flower had a wild billowing look about it, and reminded me of the deschampsia seen on motorway embankments or marshy moorland in the UK. True to form, it produced seed in abundance, which then germinated easily, so by planning ahead it was possible to raise enough plants for a small ‘meadow’ area in the front garden. 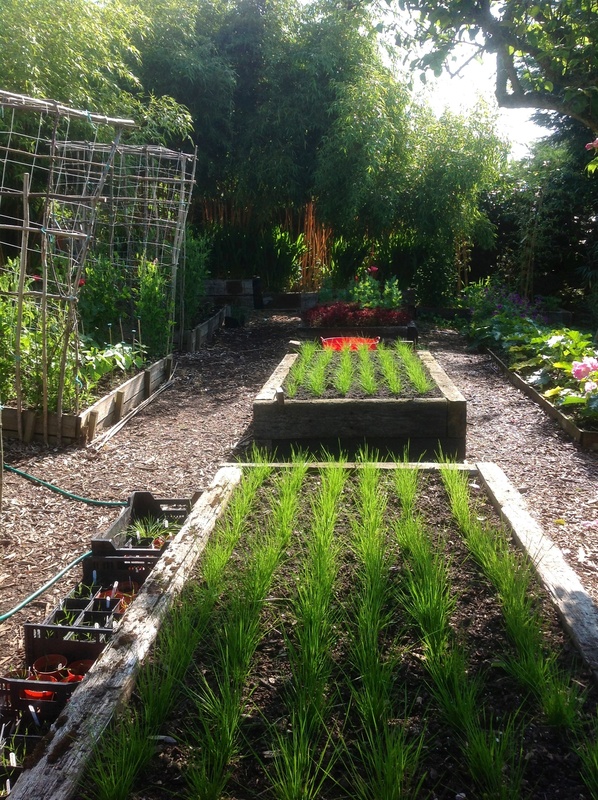 In 2013 the first year seedlings in the sleeper beds made a uniform leafy display across to the bamboo Phyllostachys vivax. [The dogs treated the beds like a raised lawn, rolling over the stout young tussocks and the flat, rather sharp edged leaves didn’t appeal to them either. It seemed a promising start.] 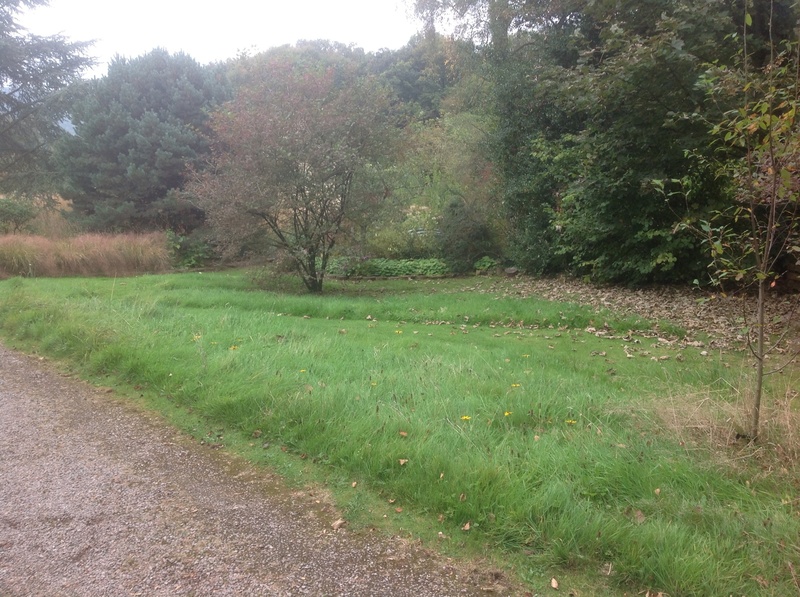 This was the area of rough grass that I had in mind for a small informal ‘meadow’ and a manageable spot to contain the enthusiastic seeding habit of the deschampsia. The site is fairly open, over squelchy clay, and in mid summer catches the evening sun. Through the summer of 2014 the nursery beds of deschamspia planted at varying densities did well. They had reached mature flowering size by just their second year, and the mass effect of airy panicles held clear of dense cushions of foliage was a delightful sight. 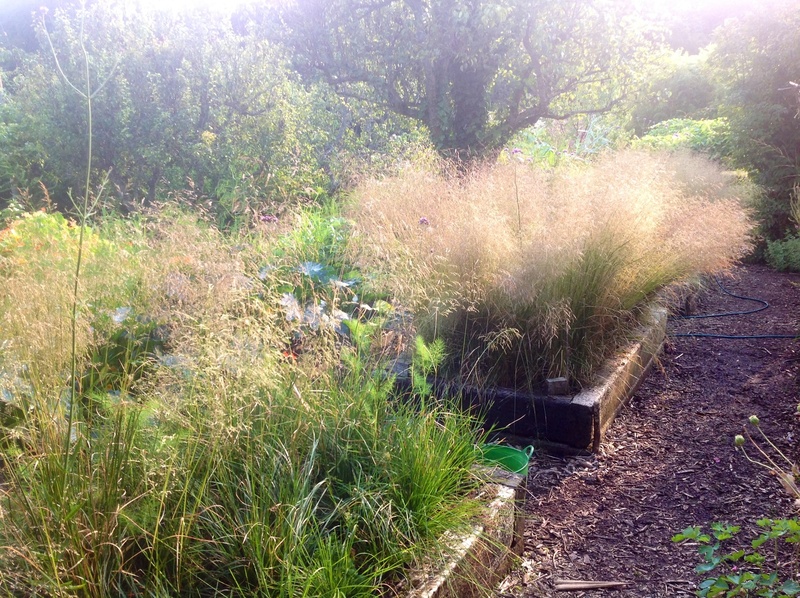 The deschampsia passed what I think of as ‘the lodge test’. Lodging only effects a few varieties of ornamental grass, in much the same way as not all herbaceous perennials require staking. The term refers to flowering stems that have fallen over following very heavy rain and it may effect some of the tallest, most slender stemmed grasses. Left to dry naturally the stems should return upright with minimal snapping at the nodes. 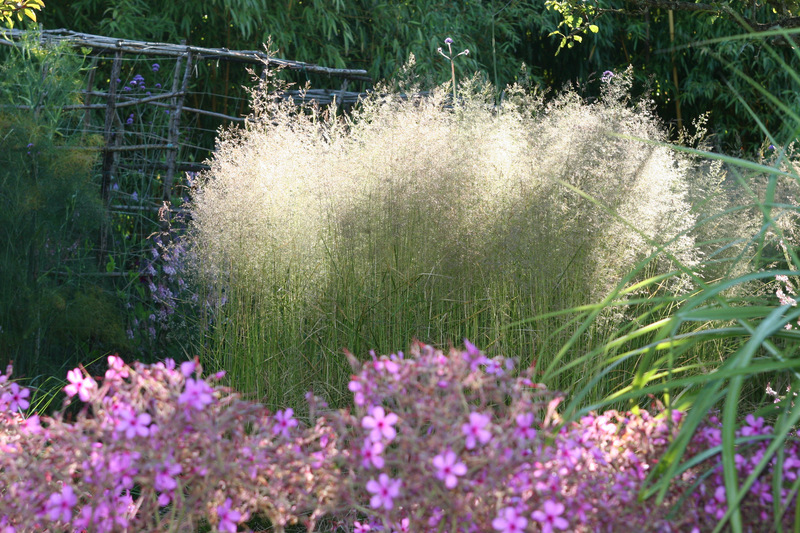 Despite the fact that deschampsia cespitosa holds its flowers on the finest of hairy filaments, the two densely packed beds recovered from heavy downpours, but a lower final planting density, as used in the third bed, seemed a better idea. In mid June of the same year, consecutively sown second year molinia seedlings (on the left) were forming dense, sizeable green leafy mounds and were only just producing flowering spikes. In comparison, the deschampsia (on the right) was setting seed and the leaf tussocks were starting to take on a characteristic thatchy look. The contrast suggested a scheme to include molinia dotted through the deschampsia as a form of succession planting, using the molinia to provide impact in late summer. 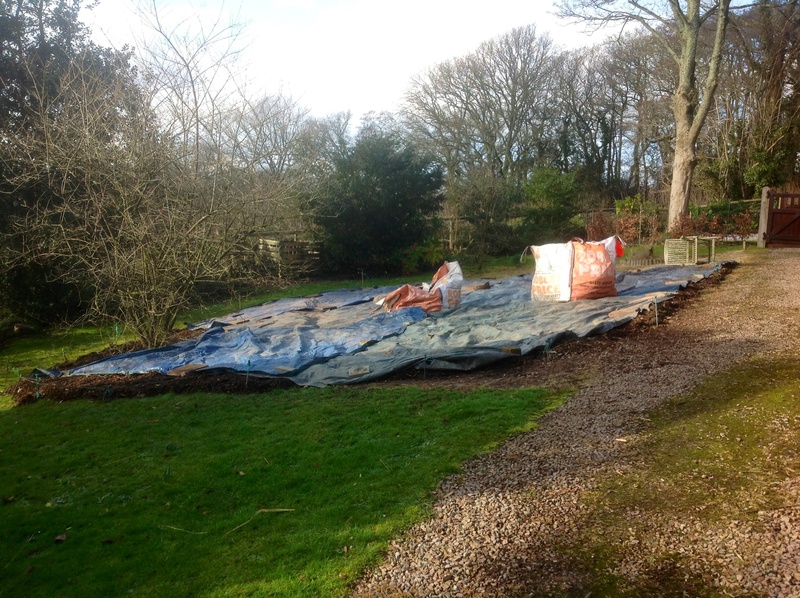 Last autumn the area was treated for weeds, particularly couch grass and creeping buttercups; in the winter it was mulched with rough bark and sheeted so it would be ready for planting by early spring 2015. 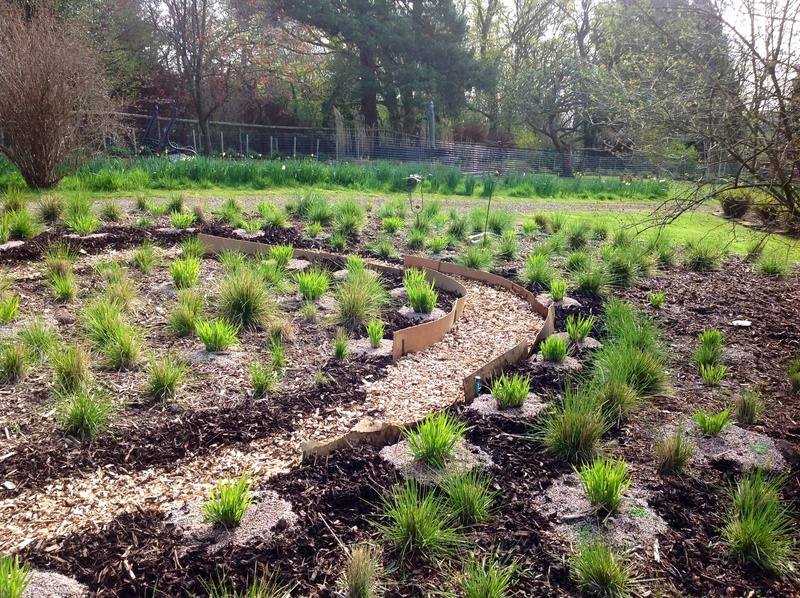 The then three year old plants were lifted in March, as soon as the deschampsia showed new growth. 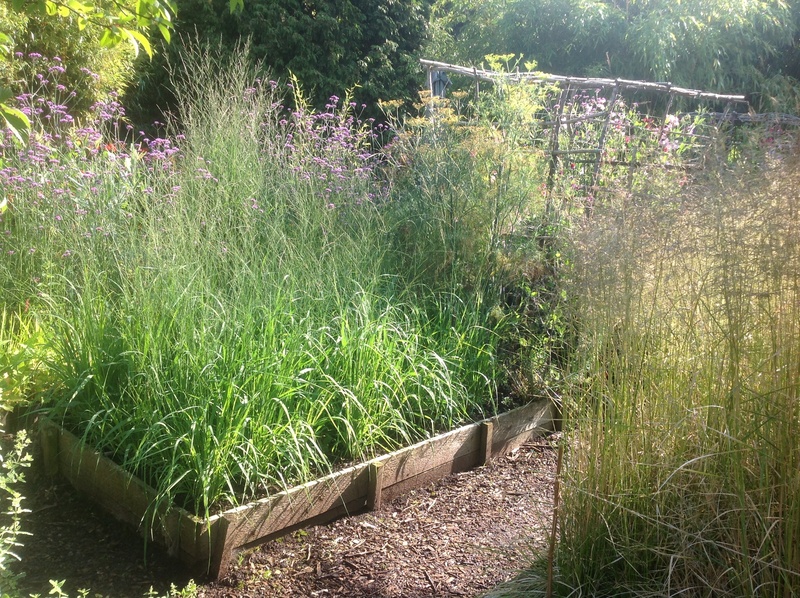 As 10 litre specimens and long lived perennials the molinia were spaced at a minimum of 1.5 metres apart, this allows them a good square metre at maturity. Whereas, the shorter lived deschampsia were divided to rejuvenate the mature plants and interplanted among the molinia at 5- 7 plants per square metre. Some of the deschampsia look a bit care worn, 2nd year plants would have looked fresher in spring. Other self-sowing perennials and biennials have been dotted through the area, including Verbena bonariensis, Honesty and Teasle to offer some contrast in colour and form. Maintenance is planned to be as minimal as possible, basically, an annual haircut with a strimmer. Hopefully, as good sized plants with vigorous natures they (or their progeny) will cope with the rough treatment and out-compete the worst of the weeds. This is a bit of an experiment, but it’s fun, and possible thanks to grasses raised easily from seed.